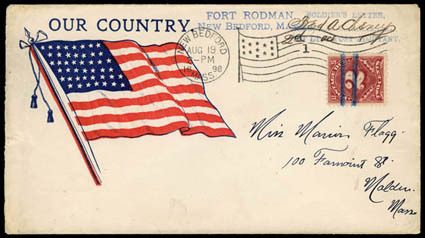 (Spanish American War Patriotic) "Our Country" Waving Flag, red and blue patriotic cover with blue "Fort Rodman, New Bedford, Mass." handstamp and blue "Soldier's Letter 1st Lt. Post Adjutant" handstamp signed by officer at top, "New Bedford Mass. Aug 19 1898" waving flag machine cancel to Malden, Mass. with precancelled 2¢ postage due affixed, Very Fine and attractive. A link back to Sale 75 - Lot 180, along with its description, will be appended to your message.